A clear sky. Low around 35F. Winds N at 10 to 20 mph. More than 120 people showed up to support the Jayden Cox fundraiser Monday evening at Boonies on the Avenue. Jayden, a third-grader from Colorado Elementary School, fell 20-25 feet at Wildcat Den State Park just over a week ago. He will start therapy this week. MUSCATINE – The word Monday evening is that Jayden Cox, 9, is doing very well in the pediatric hospital in Iowa City. And that’s before he learns of the overflow crowd at Boonies on the Avenue on Monday night that came out to support a fundraiser to help defray costs of his hospital care. At 6:15, people were still waiting for seats at the already-full sports bar downtown. And people were continuously coming in. 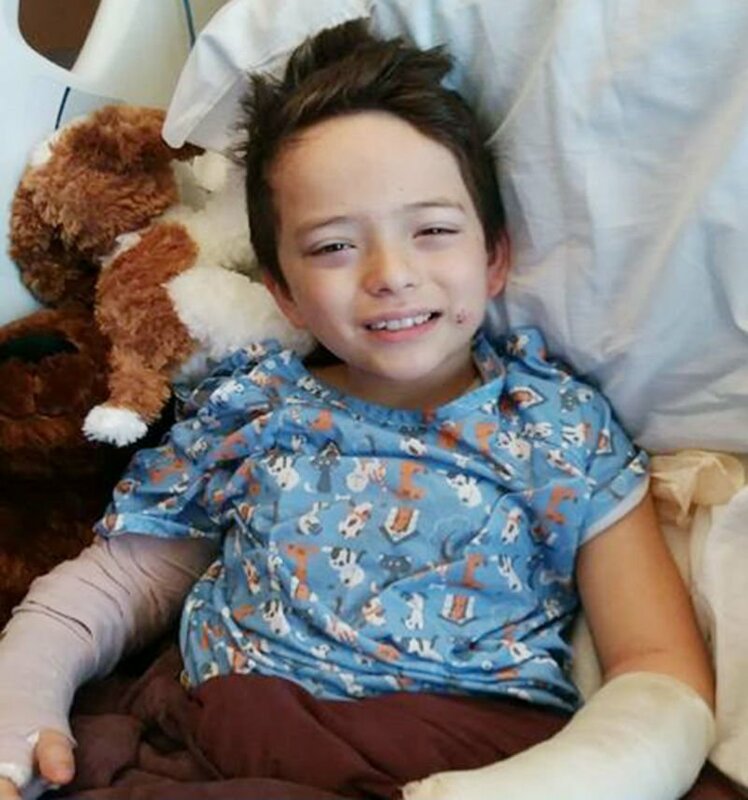 Jayden is the third-grader from Colorado Elementary School in Muscatine who fell 20-25 feet April 8 at Wildcat Den State Park on the outskirts of Muscatine. Initial reports on the police radio had him unresponsive and suffering a severe head injury. He was taken by helicopter to the hospital. However, the news has continued to get better since that moment. Jayden’s mom, Sara Cox, works as a para professional in Susan Smith’s fifth-grade classroom at Colorado Elementary School. Smith was shocked and devastated when she learned of Jayden’s fall. “Because it could have happened to any of us,” she said, “because we take our kids out to Wildcat Den all the time. Smith, one of the organizers, noted that Mike “Boonie” Kleist called the school district and offered his restaurant and 20 percent of the proceeds to the cause when he learned of the accident. The school sent emails to parents Thursday telling them of the event Monday night, and the results were off the charts. “We have awesome families from Colorado School that brought in baked goods that we are selling, free-will donation. And we’ve made a lot of money tonight,” Smith said. It appeared many at Boonie’s knew Jayden, or one of his family members. Smith teaches his sister, Ellie, but knows Jayden, a third-grader, too. Besides well over 120 people happily joining together for an important cause, their spirits had to be helped along by the news of the day on Jayden, who did suffer a subdural hematoma but no injuries to his brain. Jayden also suffered a dislocated elbow, two broken wrists, a fractured pelvis, a lacerated kidney and many cuts and bruises. But it's how he's doing already that has every one smiling. Smith’s son, Clayton, a seventh grader, knows Jayden, too. Jayden is “energetic and kind,” Clayton said. Clayton, too, was amazed at the turnout.